Here is something I worked up for you. I did not realize how well I was really doing with the TradersCouncil mentor program until I actually did this. I never kept track of my totals for the year and never looked at it. I know I was making money but I didn’t realize how much it actually was. Sorry its kind of a long email with lots of images. I just want to thank you once again for this life changing training and education. I don’t know where I would be without you. Probably wouldn’t be trading any more. 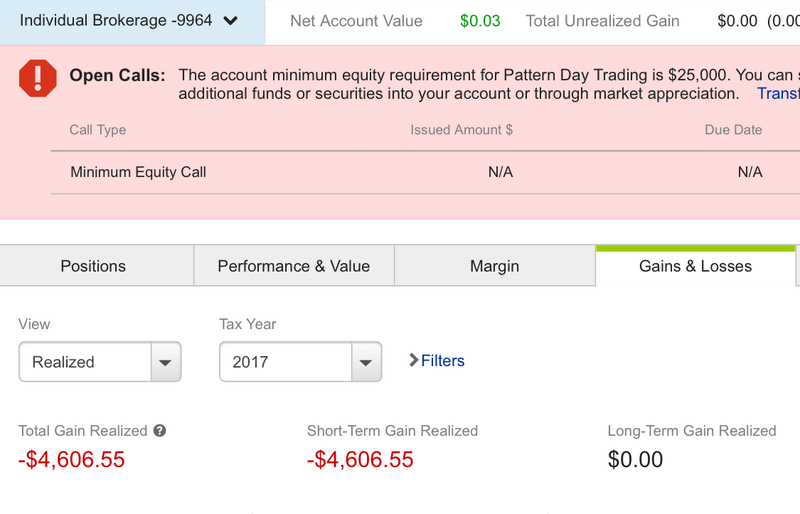 Account #1 2017: Started trading on my own in 2017 and had no clue what I was doing. I quickly managed to lose $4606.55 in probably less than a month. Account #2 2017: Joined my first service trying my hand at penny stocks (not one from Jeff Williams) again and thought maybe I would have a better chance this time because the mentor was being praised for making millions. Turned out to be a pump and dump which made me lose another $3214.62. Bringing my total losses to $7821.17. Account #3 2017: Joined my second service to learn how to trade penny stocks again. Got stuck in another pump and dump which made me lose another $7238.89. Bringing my total losses to $15060.06 for 2017. My total losses would have been more but this was the point when I joined the Traders Council and turned $500 into $5000 in a very short time trading options with you. Once I did that I stopped trading for the last two months of the year and took a vacation to Mexico and began paper trading and studying the education material. I paper traded for more than two months. 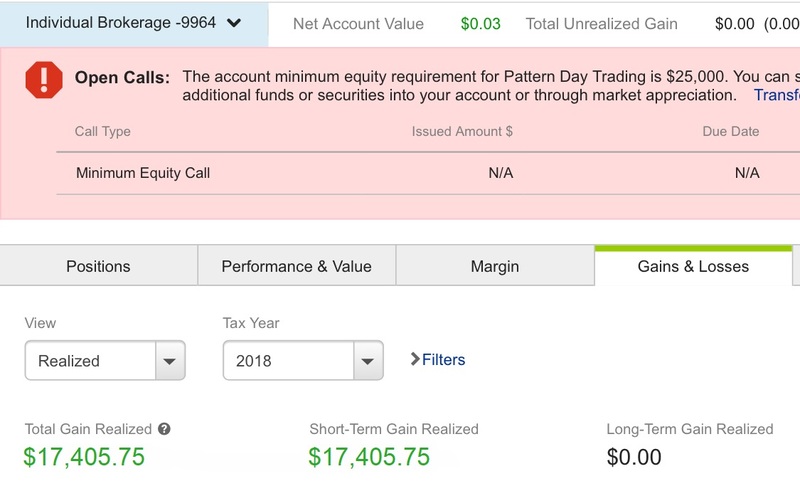 Account #1 & #2 2018: Finally jumped in and started traded options with you at this point. I started out with two small accounts. One had $1000 in it at that time and the other I had $5000 in. From January 1st to January 16th I had a net profit of $15290.40. Which actually put me in the green for the first time ever. Not much green but I was finally up $230.43 after losing all that money in 2017. Account #3 2018: At this point I decided to get a little more serious with my trading. I had switched over to E*Trade at this point because TD Ameritrade put a restriction on my account. I pulled all of my money out and funded my E*Trade account with $10000. From the middle of January to May 4th, I have made another $27017.90. Bring my total trading profits to $27248.24. Account #4 2018: I wanted to see what I could do with a $1000 account at this point for the month of April. I started March 28th and at the end of April I had a net profit of $17405.75. 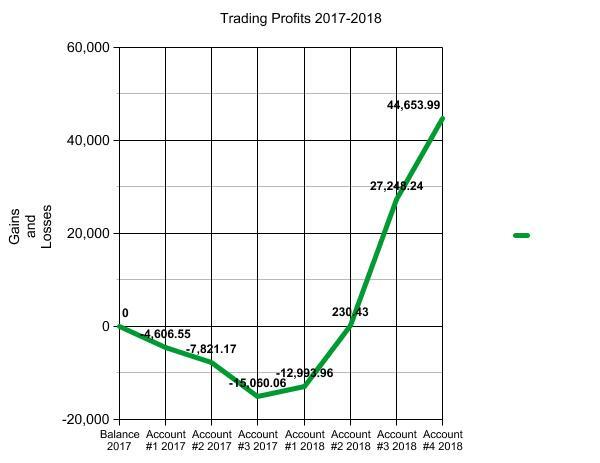 This brings my total profits for 2017 and 2018 to $44653.99 and my Total profits while trading with the Traders Council to $59714.05. I dug myself out of a pretty deep hole. Here is a graph to show my progress from 2017 to 2018. Why keep pushing it off gang, upgrade now to TradersCouncil mentor service and maybe YOU’LL be our next small account into a HUGE account success story! Jeff, all cash for the weekend, it seems. That being said, my cash is up 51% in 15 trading days. Thanks to the education here. +$5,100.